The folks at Creemore Springs are proud to announce their wildly popular Kellerbier craft beer is back on shelves on April 2 – and will remain there year-round. Formerly brewed in extremely limited quantities for the summer, Kellerbier has now been added to Creemore’s regular lineup of quality craft beers and is available during all four seasons at Beer Stores and LCBOs across Ontario. When traveling in Bamberg Germany, Brewmaster Gordon Fuller happened across a unique style of beer know as Kellerbier (Cellar Beer). After much research and testing, Gordon and his team set out to create their own style of Kellerbier created in the time-honoured tradition as it was in Bamberg. Due to the remarkable freshness of this beer, it is brewed primarily for local consumption, a philosophy of beer making that fits perfectly with that of one of Ontario’s finest craft brewers, Creemore Springs. Kellerbier dates back to the Middle Ages in small artesian towns in rural Germany. This unusually hoppy beer comes right from the cellar and is naturally cloudy due to the vitamin rich yeast still present in the beer. Kellerbier is lower in carbonation and abundant with hop aroma and flavour. Small-batch brewed, this unique beer uses only four natural ingredients and is then packaged unfiltered. Often served as an aperitif before dinner to stimulate the appetite, this surprisingly thirst quenching Kellerbier has a citrus and spicy finish left by the unfiltered yeast and a lavish malt backbone. With the year-round availability, Kellerbier’s look will get a refresh with new artwork for all cans and packaging, and all bottles in the hand-picked 6-pack. 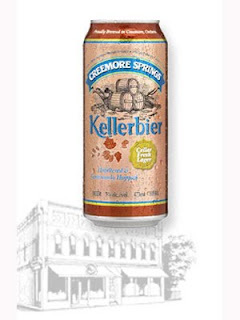 Equally exciting, Creemore Springs’ Kellerbier was recently recognized with a gold medal for ‘best Kellerbier’ at the 2011 Canadian Beer awards. Often compared to a summer wheat beer, fresh, locally-brewed Kellerbier is the perfect fit for warm summer nights or days, in the city or out. Kellerbier is available in all Ontario Beer Stores and LCBOs, for $2.80/473ml can.